Buying Professional Services – How Not To Do It! Darren (a senior manager) has brought in an old colleague, Helpful Helen, because she’s really - helpful. They’ve got a particular project on, and he wants to set her up as a new supplier. Rob, procurement manager, feels he has to agree, says ‘of course’, but for how long? – maybe give it 3 months ‘til the project’s over? Rob – (even more frustrated) – “Well we’ll have to give her notice but we want full IP transfer”. Do not let personal relationships get in the way of good practice – all providers should be treated the same (including insurances) – no matter what! You always need a client-side contract – no matter what! 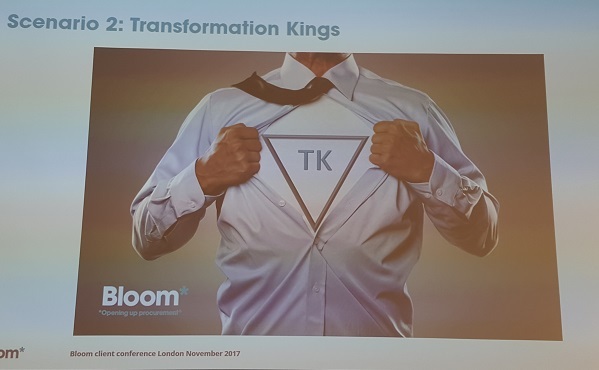 They did a second scenario (I won’t go into the dialogue) about “Transformation Kings” being appointed via an existing public sector framework during a transformation project to deliver five programmes on a T&M basis. The hiring manager didn’t ask the key question - what are the outcomes that we want from this work? Two of the five programmes didn’t deliver, in fact the provider had burnt away £3m so far, achieving not a lot. But the Framework didn’t allow for risk transfer to the supplier – it was T&M only. When Rob wanted to know how it was going, Darren could only point out that it wasn’t so good, and in fact, it was their own fault. They hadn’t indicated what they wanted of the provider at the beginning, and he was afraid if it ended in legal dispute, not only would they lose money, TK could, unfairly, lose its reputation! Durham CC is a NEPO member and one of the first to establish the NEPRO framework now provided by Bloom, essentially one of its first clients. So they go back a long way, and although this was fun banter, it did serve to highlight some familiar and avoidable disasters. So Darren went on to explain just how going through Bloom is a safe and legitimate route. It’s where procurement meets recruitment, he said, with better understanding, visibility and control of spend. It means you will get a better cultural fit, which for us means we can basically manage the private sector in the way they would expect to be managed. "It also creates more local supplier opportunities, and encourages direct spend with them. And you can benefit from competitive processes or direct award – it has that kind of flexibility." What they notice as a huge advantage as a client, is the speed with which Bloom gets from request received, to project start date (on average 33 days). They also challenge the need, to give them a business case that takes them to market with knowledge, so that they are looking for the right skills and capabilities, and an outcome-based approach, which means a consultant doesn’t come in and build the business case for more hours. "All of that, along with regular reporting, gives our senior management confidence," he said. And we’ll hear from Cornwall CC in our next post.